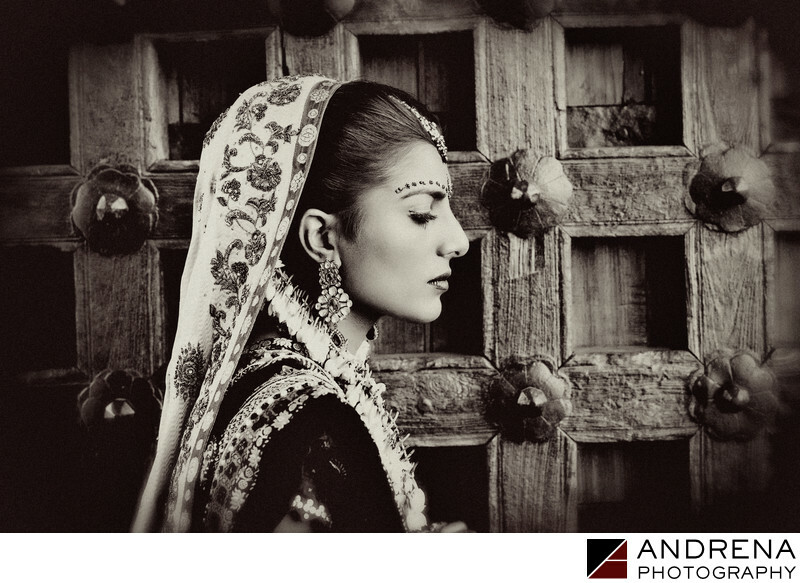 Udaipur, India, is a magical place for weddings, and I feel lucky that I have had the privilege to photograph two Indian weddings there. The city itself surrounds Lake Pichola, which was created in 1362. The lake itself boasts Jag Mandir and the famed Lake Palace Hotel, which appears to be floating in the middle of the lake, and is actually accessible only by boat. There are many palaces situated on the shores of the lake, but there are also palaces just outside of Udaipur that are wonderful places to photograph weddings. One such palace is Devi Garh, which was built in the 18th century and restored in the 1980s. The restoration of the palace took more than 15 years, but it is now included on many lists of the very best luxury hotels in the world. The palace does not include an elevator, so if you are ever lucky enough to visit or photograph a wedding there, be prepared to climb hundreds of stairs. I photographed this portrait in front of the grand doors to the palace. The doors are high enough to allow elephants to walk through, but I was mostly fascinated by the texture of the wood and the use of metal. I used an antique black and white processing style for this image, which gives it a more old-world feel. Destination Indian wedding photographed at Devi Garh, Udaipur, Rajasthan, India.